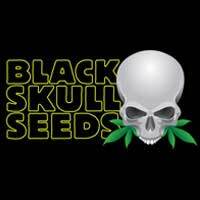 Mandala seeds Kalichakra is an exotic and east to grow sativa dominant cannabis strain. Kalichakra from Mandala seeds has a very high Calyx to leaf ration and attractive conical buds. 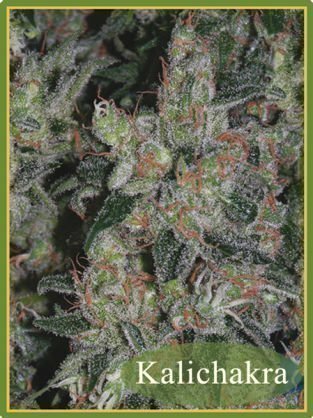 Kalichakra has high mould resistance and low odour so is a great outdoor stealth strain. Kalichakra is named after the Indian goddess Kali (a consort of the ganja smoking Lord Shiva) and combines unique landrace genetics from South India and the Golden Triangle. Unlike typical Sativa’s she grows extremely well indoor and has been known to perform satisfactorily even under low light. She is surprisingly adaptable, easy to grow, and a good choice for novice gardeners. Mother plants provide abundant clones. The cuttings can be placed into flowering early for cultivating shorter plants on a hydroponics table, in a Homebox, etc., or to decrease flowering time. In hydroponics rapid growth can be expected and with CO2 enhancement in the air you can harvest huge bumper crops (adjust the EC of your nutrient solution to a higher level when using CO2). Kalichakra responds well to being tied down and can grow an impressively large main cola from the even light distribution. However, due to the airy growth pattern light passes through to all flowering shoots. Therefore you don’t have to tie down the plant unless you unexpectedly run into problems with height or have a very poor light source. We recommend this strain for SCROG and nearly all plants can be easily fitted into a SOG (sea of green) space despite the branchy growth. Due to the low odour this is a good choice as a ‘stealth strain’ for discreet cultivation. Kalichakra grows fat conical shaped buds that usually peak in towers of calyxes. The calyx-to-leaf ratio is exceptionally good and makes harvesting very quick and simple. 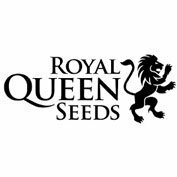 The phenotype with the long head bud dominating the plant is a ‘keeper’ (good choice as mother plant or breeding) for highest yields. 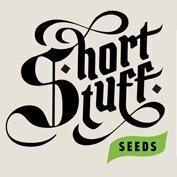 With 4 weeks vegetative growth indoor under 400W HPS/m2 in quality soil the height of the plants averages between 100-120 cm. More than half tend to grow around the 100 cm mark. Plant height can be easily controlled by choosing a shorter vegetative time or pruning the top bud. The plants grow in a typical sativa style with a Christmas tree shape and medium to long internodes. Some may need support towards the end of flowering to support the heavy buds if the plant has not been pruned or is not standing in close rows in a SOG setting. To maximize yield and strengthen upper branches it can be useful to remove the branches at the bottom 2-3 internodes on plants from seed before switching to the 12/12 light cycle. Although you can harvest after 68 days some plants from seed may still develop fatter buds for an extra week (clones tend to finish earlier). You can reduce the light cycle by an hour prior to harvest to speed up flowering if you are in a hurry. This sativa has good mold resistance thanks to our dedicated breeding goals in minimizing undesirable genetic traits. Up to 42°N Kalichakra can deliver high yields outdoor and is one of the best strains available for hot, warm-temperate and tropical zones. In far northern climates we recommend a greenhouse. Results and harvest time will depend on plant care and local weather. A sweet-minty taste accompanies most of the fragrant buds. The high is smooth and starts up leisurely. It is especially well suited for persons sensitive to a racy heart or anxiety. Kalichakra can have a very positive mood-enhancing effect which gives you a sunnier outlook on life. A warm and relaxed bodily sensation is not uncommon in combination with the functional, social high. It’s a great daytime smoke for all kinds of activities, but also helps you lie back and relax whenever you feel like it. You could call it balanced yin-yang ganja that unites the best of both worlds. 500-550 gr/m2; 850-1200 gr. per plant outdoor in the ground. Medical-grade marijuana for a broad spectrum of medical use. Assists against depression and lethargy. Very pleasant and smooth sativa high with no negative side effects, mood-enhancing to euphoric, sensual and stimulating. Great for active recreation or relaxation.